These psychological triggers will help you get a leg (or two) up on the competition. Image by Amanda Shigehiro via Flickr. Writing effective landing page copy isn’t just about nailing a really clever pun. It’s about understanding that real people are responsible for every click on your landing page. Have a look at your most recent landing page. Are you leveraging any psychological triggers in your copywriting to motivate your prospects to take action? Good ol’ social proof and urgency? Or – *gasp* – none at all? Here are four psychological triggers that will help you write landing page copy that motivates your prospects to take action. There’s a reason that casting villains has been a common marketing and advertising tactic for many years. Decades ago, sociologist George Simmel argued that we create common enemies because it unites us with groups of people we believe to be like us. And more recent studies, such as “Interpersonal Chemistry Through Negativity: Bonding by Sharing Negative Attitudes About Others,” show that is may very well be true. Have you seen any advertisements featuring annoying co-workers, boring jobs or mean bosses? Or how about all of those Apple advertisements that paint PC users as pocket protector-wearing nerds? Relating to prospects’ pain in your marketing campaigns can also help you call attention to the benefits that your product or service brings. “With an enemy, it’s easier to tailor messages that play up your strengths. If your competitors are lacking in those areas, that resonates particularly well in the marketplace. In other words, painting a vivid picture of an enemy not only helps you relate to prospects – it’s also an effective way to show them how you can help absolve them of their pain. Explaining what distinguishes you from the competition can be challenging – but describing a common enemy can be an easier way to write landing page copy that resonates. They hook visitors by creating an enemy out of soul-crushing meetings (who hasn’t sat through one of those?). And once they’ve connected with visitors through a mutual hatred of boring meetings, they offer up their app as the solution. Ask yourself, “What is the antithesis of my brand values?” If you’ve successfully created brand values that align with the interests of your prospects, then the antithesis can serve as a powerful catalyst for inspiring action. Do prospects talk about “the enemy” in online forums or on social media? Swipe their wording to use on your landing page to relate to prospects – and then offer up your solution to remedy the pain. People have an inherent need to build community and a sense of belonging. Understanding this basic human need is important because it can be a motivating force in your landing page copy. College student participants were asking to read an article by an advanced math student, which included a bio with the birthday of the author. For half of the participants, the author biography was set up with a birthday that was identical to that of the participant. For others, the participant and the author had birthdays several months apart. After reading this article, participants were given a math problem that is impossible to solve. Participants who shared a birthday with the author of the article worked longer on the impossible problem than participants who did not share a birthday. This study goes to show that a sense of community or mutual interest (no matter how arbitrary) can be a powerful motivating force. Click for full-length landing page. Emphasizing the size and nature of its community. Reinforcing their focus on the writing niche which helps draws in their target customers. 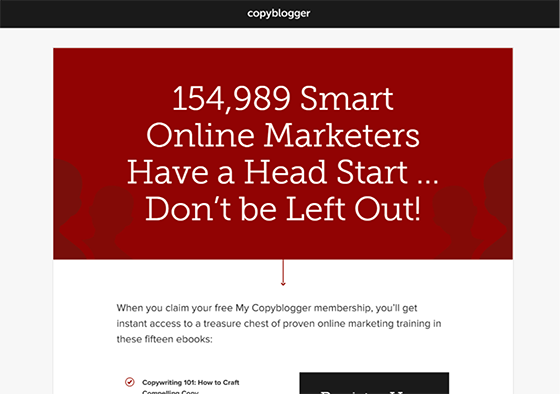 Naturally, a writing-focused community of thousands of smart online marketers is an appealing picture for anyone who fancies themselves a serious content marketer. This type of copy triggers their audience’s FOMO, making the choice a no-brainer. Create a sense of community in your landing page copy. Consumers identify with others who think and act like them, especially if that group is associated with something aspirational and positive. One of the best ways to build community is with a unique point of view or compelling vision. As Simon Sinek, the author of “Start with Why: How Great Leaders Inspire Everyone To Take Action” says, start with “why.” Explain why you do what you do and you’ll attract others who share common goals. We’re hardwired to get what we want – as soon as possible. Many psychological studies demonstrate and explore our natural desire for instant gratification – take for example the iconic Stanford marshmallow experiment in which children are offered one marshmallow immediately, or two marshmallows if they can wait 15 minutes. 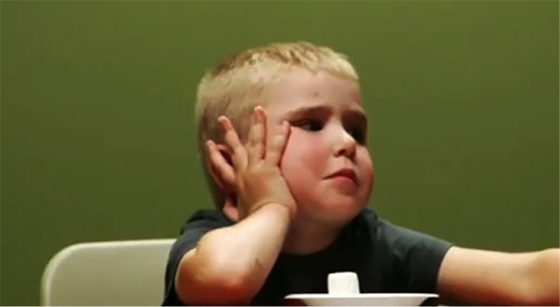 Studies such as the Stanford marshmallow experiment seek to explore our desire for instant gratification. Image source. One of the powerful forces behind these urges is the pleasure principle: our innate drive to gratify all our needs and wants. Because we’re hardwired in this way, teasing prospects with instant gratification is a powerful way to inspire them to take action. Your prospects are hardwired to get what they want. Show that you’ll help them get it quickly! 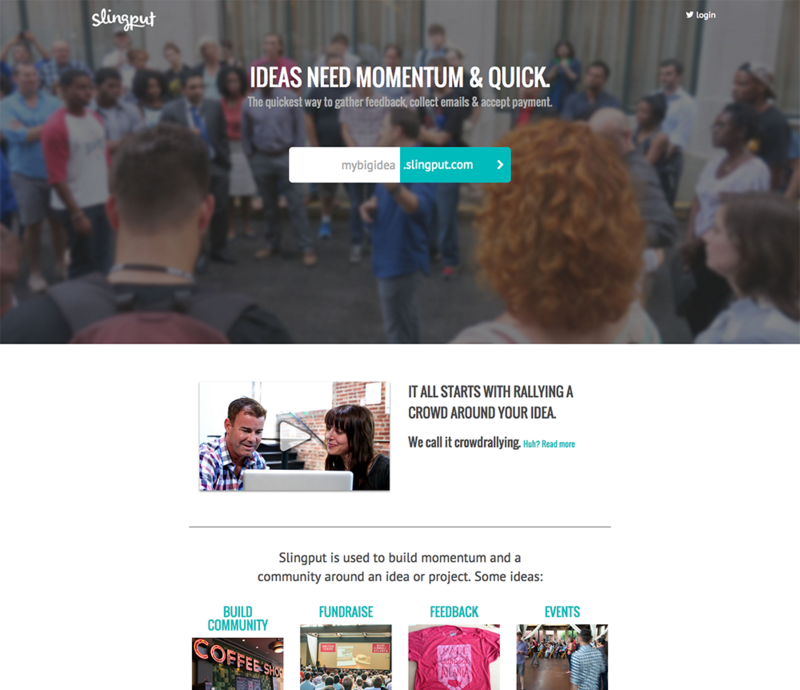 Slingput is a service that helps you quickly get your project ideas off the ground. Phrases like “Ideas need momentum” and “The quickest way to… “ are likely to resonate with visitors who have a great idea that they know can really take off. If you think you’ve got the next great idea (maybe the next “Ship Your Enemies Glitter”?) and need a hand to get it off the ground, you’re likely to click that CTA. Leverage trigger words that scream instant gratification; use words like “instantly,” “immediately” and “fast” on your landing page. As humans, we relate to and engage with marketing campaigns that tell stories that compel us. A really good narrative can even increase our perceived value of things. When Joshua Glen and Rob Walker ran a social experiment in which they auctioned thrift store items on eBay, they commissioned authors to write short stories for the item description. The result? The objects, purchased for an average of $1.25 apiece, sold for almost $8,000 in total. What am I getting at here? Good storytelling captures our attention and can affect our perceived value of things. And it’s a really powerful copywriting technique that can increase conversion rates. 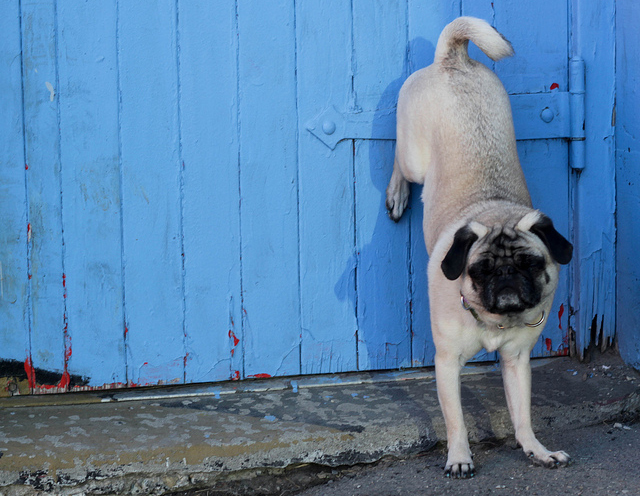 Are prospects on your landing page just not engaged? Try telling a compelling story. If you’re wondering how your SaaS landing page could possibly incorporate storytelling, take a page from Visual Website Optimizer’s playbook. 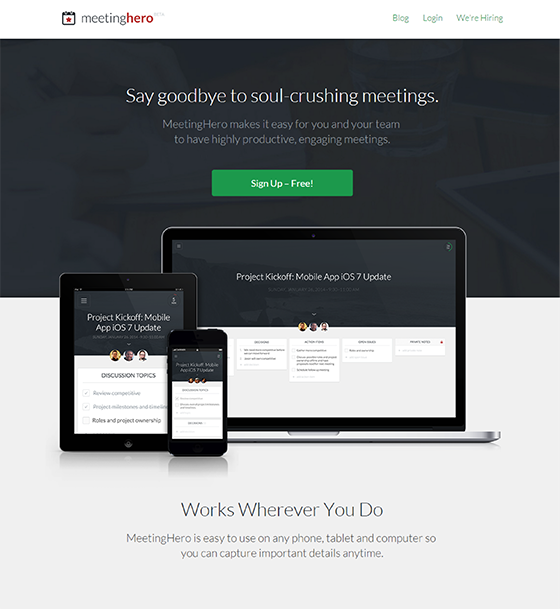 You’ve really got to click through to get the full effect of VWO’s awesome landing page. Image source. The page is fun, quirky and keeps you engaged and scrolling all the way to the opt-in form at the bottom. Will a narrative like this inspire your audience to convert? I can’t tell you for certain – but it’s certainly worth a test. If there’s a compelling story behind your product or feature launch, tell it! If needed, use video to add more color and flair, as Unbounce did on their mobile responsive feature launch landing page. Provoke an emotional response by ensuring that the story is told by someone your audience can relate to. Remind prospects of their pain points so they get a clear idea of how their pain can be solved with your product or service. Though these psychological triggers paint a portrait of human nature in general, they’re to be taken with a grain of salt. The human mind is complex – and all the psychological studies in the world can’t predict our sometimes irrational behavior. It’s important to research your unique audience and understand which triggers resonate with them. The only way you can be absolutely sure is to run A/B tests to validate your hypotheses. 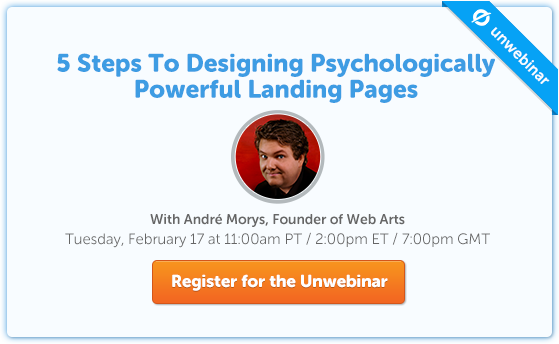 Which psychological triggers do you use in your landing page copywriting? Which one has worked best for you so far? Let us know in the comments below. Vinay Koshy is the Founder of Sproutworth, a content marketing and conversion optimization blog. Read his latest blog posts, follow him on Twitter, or download his report of 5 advanced psychological hacks you can leverage to make your landing pages more persuasive.